Cold dessert recipes are the perfect treat to serve on a warm evening. Light and refreshing. It's the perfect way to top off a meal around the pool. Year round they happen to be my favorite desserts as well. 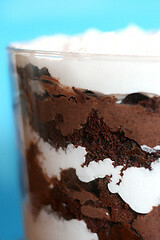 This chocolate trifle recipe serves a nice crowd and is full of chocolate chunks, brownies, and chocolate pudding. It satisfies any chocolate lovers cravings. It can be made a head of time so that there is no last minute preparations. If your looking for a great tasting cold dessert recipe and love chocolate this one is for your. Repeat again. Finish off with chocolate shavings on top. Strawberry dessert recipes can provide the perfect ending to your pool gathering. Strawberry dessert recipes are always greeted with enthusiasm. I've never met anyone who didn't like fresh strawberries. 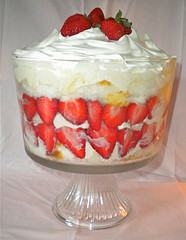 This strawberry trifle pictured above is an easy, quick but pretty dessert. 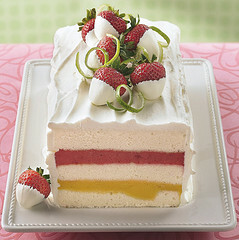 The ingredients are angel food cake, white chocolate pudding, Cool Whip and fresh strawberries. Mix a small box of instant white chocolate or cheesecake pudding with 2 cups of cold milk. Gently spoon in 2 cups of cool whip with the pudding. Repeat the layers. Top with just the Cool Whip and garnish with strawberries. I sliced some strawberries lengthwise and placed them next to the trifle bowl as you can see. 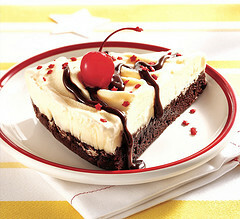 I love chocolate, and if you do too you will love this ice cream pie recipe from Betty Crocker. With ingredients like brownie mix, hot fudge and ice cream what's not to like about it? 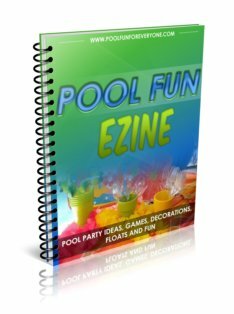 Make it ahead of time and keep it in your freezer for your next pool party or for a last minute gathering of friends or neighbors. Ice cream pie recipes can be varied by just changing the flavor of ice cream. This recipe calls for vanilla ice cream, but our favorite ice cream is Moose Tracks. So substitute the vanilla ice cream with your favorite ice cream flavor. 1. Heat oven to 350°F. Line 2 (9-inch) round cake pans with foil; grease bottoms only with shortening or cooking spray. 2. Make brownie mix as directed on box —except divide the batter evenly between pans. Bake as directed or until toothpick inserted 2 inches from side of pan comes out almost clean. Cool completely in pans, about 1 hour. Do not remove from pans. 3. Spread slightly softened ice cream evenly on brownies in pans. Freeze at least 2 hours or until ice cream is firm. 4. Remove desserts from pans; remove foil. Cut and drizzle each wedge with hot fudge topping. We often entertain friends in the evening and serve one of our favorite summer desserts. 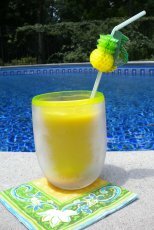 By just serving a dessert instead of a whole meal, we find ourselves inviting people over more often to enjoy the pool. Summer dessert recipes need to take advantage of whatever fruit is in season. Here in Georgia it is peach season. Beat cream cheese until creamy. Gradually beat in milk. Add dry pudding mix and beat 2 more minutes. Stir in Cool Whip and peaches. (put them in a muffin pan for a better shape - you can remove them after they become solid). Remove from the freezer just before serving as they soften really quickly on a hot Atlanta evening. 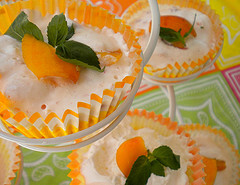 Top with a dollop of whipped cream, a peach slice and sprig of mint. Blueberry dessert recipes, like this one made from angel food cake is a favorite cold dessert recipe at our house. This is from Betty Crocker and it is called Berry Angel Delight. I used lots of fresh, local blueberries. 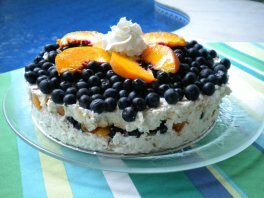 This combination of fresh blueberries and peaches mixed with cut up angel food cake, vanilla yogurt and Cool Whip is bursting with flavor. A light dessert that will soon be one of your favorites. Spoon half of the mixture into a 9-inch springform pan. Press firmly in pan with rubber spatula. Top with half of the berries. Add the rest of the cake mixture. Press firmly down with the spatula. Top with the rest of the berries. Cover and refrigerate 4 hours or overnight. Run the spatula carefully around the spring form pan to loosen. Remove side of pan. Cut dessert into wedges. Garnish with a dollop of whipped cream. I love this easy coconut cake recipe because you can make it days ahead and keep it in your refrigerator. Our friend Susan brought this cake to our house when we first moved in and it has become one of our favorite desserts - year round. The coconut frosting is made with Cool Whip and sour cream so the cake needs to be refrigerated. Combine the above and reserve one cup of the coconut mix for later. Use the coconut mix and spread it between the layers. Use the 1 cup of reserved coconut mix and mix it with 12 oz container of Cool Whip. Spread the Cool Whip Coconut Frosting on the top and sides of the cake. Refrigerate for a couple of hours or up to 4 days. This cold dessert recipe is great if you want to make it ahead of time - up to four days before you serve it. I've done this many times and the cake stays really moist. 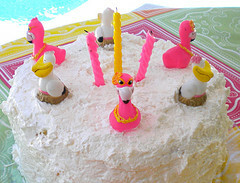 For a beach party theme, decorate the cake with colorful paper parasols from the dollar store.